Long story short: Tradition and luxury collide elegantly in this testament to an architectural vision. 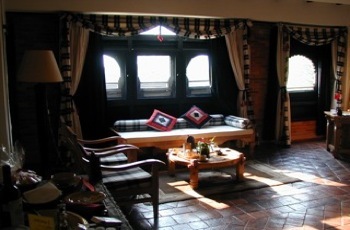 The hotel is a village-like compound of painstakingly-constructed buildings, all decorative tile and carved wooden windows. The word 'sanctuary' is bandied about a little too much, but through the doors of Dwarika's is a refined, evocative space that will leave a lasting impression. Short story long: It was getting a bit heated with me and the cabby, to be fair. 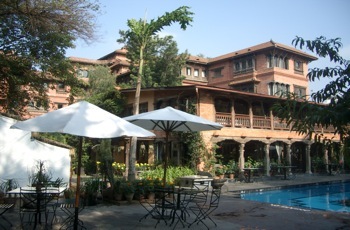 Kathmandu is a bit Wild West, even in the lobby of the city’s poshest hotel. There’s a lot of negotiation necessary, not least with the cab drivers who only want to make a living, sure, and western tourists are the biggest cash cow, if cows ever needed herding about in a rusted banger. I’m going a fair distance, and the driver has no English, so I was happy when the lobby staff chirped in and diplomatically arranged the journey. It could just have been to avoid a set-to on their driveway, but it seemed like they understood both sides. I’d say discretion and tact were high on the list of the attributes of the staff here. It’s a quality gaff for sure, but they hit the sweet spot between formal and chatty. A local, who I had no reason to distrust, told me something. She said that the story the hotel give about all the buildings being reclaimed from certain destruction is pretty much bullroar. The hotel, needless to say, beg to differ. 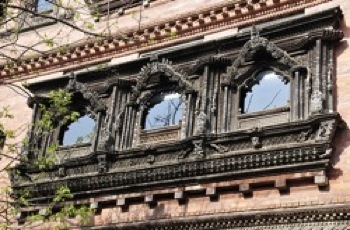 They reckon the founder, Dwarika Das Shrestha, started sweeping all these pretty buildings away from the bulldozers in 1952, saving a growing collection of wooden masterpieces like some kind of architectural Schindler’s List. The truth is probably somewhere in the middle there, but well, the legend is a harmless enough one and the aesthetics invite an open mind. The carved wood and fancy brickwork make for impossibly beautiful grounds, all the more so for the stark rubble that makes up the immediate neighbourhood in downtown Kathmandu. It’s like staying in a UNESCO Heritage Site (it actually does mimic the UNESCO sites close by). “I wouldn’t use the pool,” was the unnecessary January advice, ornate and visually inviting as it was. Instead my facility-testing rested on the Pancha Kosha Spa, which doles out the usual high-end, suitably joint-pleasing treatments in some style. The serenity is only really broken by the odd braying western businessman and the knowingly evocative if not outright manipulative traditional music and dance displays that take place each evening in candlelight. Looking on through the wooden slats of your bedroom window, you could be in the 16th century. I don’t feel poetic in many hotel rooms, but the dark woods of the high quality fittings, antique like without seeming contrived, inspired me to loll around and pretend to write in my notebook. Staying here is a cinematic experience whether taking a bath, flopping onto the four poster bed dramatically or thinking how good the chest of drawers would look in your house. I remember the food as much as anything. Go to breakfast early and enjoy the sunrise, hiking groups discussing their plans and one of the most varied bumper breakfast buffets I’ve ever seen. Home made everything, with artisanal sides of everything else. I siphoned off the excitement of some neighbouring mountaineers off for their expedition and then went back to bed for a nap. In short, if you’re out this way, and you have a little bit of money to spend, do yourself a favour and stay here at least a night. If all possible fibs were this good looking, would anyone really mind? Krishnarpan, which serves up outrageously gourmet versions of classic Nepali food. Cross your legs for a regal meal that you eat sat on cushions around the low tables - good enough for Prince Charles and other posh punters. Brace (and starve) yourself for the 22-course taster menu. If you survive the cramp, one of the impeccable wait staff will obligingly roll you out. Shandy pockets: It's all relative, I suppose, but the rates (starting at £160/$220 per night) seem like a bargain, especially as you're staying in one of the world's truly memorable hotels. The large business hotels in the city are the same price, and nice enough, but I doubt you'll be showing off photos of them to your friends a year later. Review by Paul Oswell. Paul was a guest of Dwarika's Hotel.